Add glamour to your latest head wear. Instant style to your old hat and cap. Looks fantastic on the lapel of that jacket or gilet. A beautiful way of pining that collar on your glamourous throw or wrap. 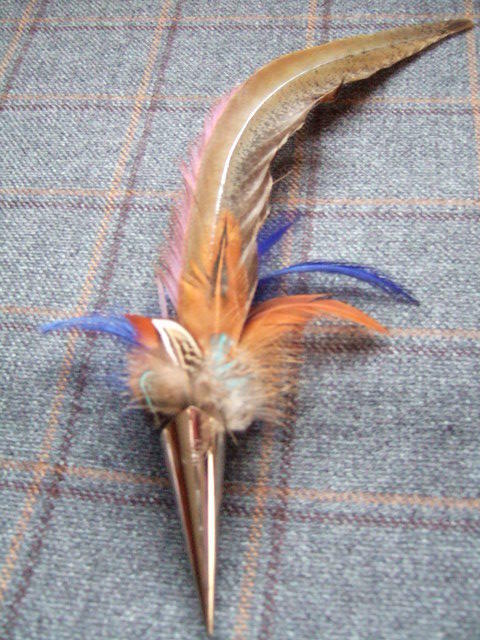 We individually manufacture every bullet and flute using natural and tinted feathers. By Tinting some of the feathers we not only add another layer of colour. It also helps to bring out the many colours found within the tweeds you will want to wear it with. Our flutes are plated in silver or gold polished finish and engraved with the smiley face. The bullets are finished as they were last used. Every brooch is wired and soldered together with a double locking safety clasp. Weddings and parties have become a speciality. Great button holes and corsages.